There are times when adults settile back into some good old fashioned kid fun. Curvey and I are blessed to have our 27yo son with us for the week down at ththe beach. (Fitz as his friends call him.). This trip he decided to YouTube how the “pros” build th giant creations we see in competitions. He bought buckets and shovels and trowels. And WD40. No self respecting sand castle builder would show up with no WD40. We set up shop under a big tarp and off he goes. Fitz’s first creation. 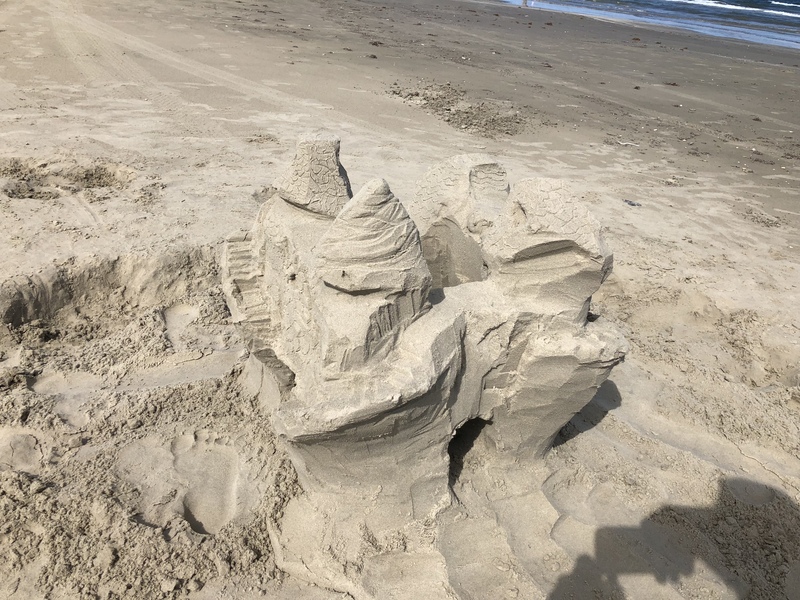 It becomes a whimsical sandcastle somewhat reminiscent of a Dr Seus Book, but it was a lot of fun to hang out and watch him work with passion and laughter. 1. If you don’t know how to do something, the Internet is full of guides. Don’t let perceived lack of knowledge give you an excuse to stop growing. 2. Getting back to things that made us laugh and smile when we were kids is a prescription for adult happiness. It just does the soul good to turn off modern life and get back to basics. Catching fireflies, eating an ice cream cone on the boardwalk, sneaking a cigarette out of your moms purse and firing up underneath the grapevines. Building sandcastles. 3. Allow those around you to take part. Share the experience. As his mom and I started to help out with small details, it became a family project. As kids cane walking by, they were acknowledged with a friendly greeting and explanations. 4. What you build will soon be destroyed. So build anyway and enjoy the moment. As we headed back down the next day to build his 2nd attempt, we came up to three little kids about age 3 digging in the sand. Then running and jumping into the his previous day’s effort, like Godzilla destroys my Tokoyo. The sheer glee of the young men destruction was infectious. We laughed and started the next build. Get back to basics and what made you happy when younger. Don’t worry about what others will think or how stupid you may look. Those people don’t matter. People that you honor with your time and energy will want to jump in and help, or at least sip a cold Corona in the shade offering moral support, crude comments and general amusement. Live life folks, it’s short. P.S. WD40 will lube anything. Even applied to the insides of buckets, making the packed sand slide right on out of th bucket. YouTube tip.